I was well into adulthood before I tasted bread pudding for the first time. Quite honestly, I didn’t really understand what it was and the thought of it was completely unappealing to me. Soggy bread in some sort of puddingy mix? 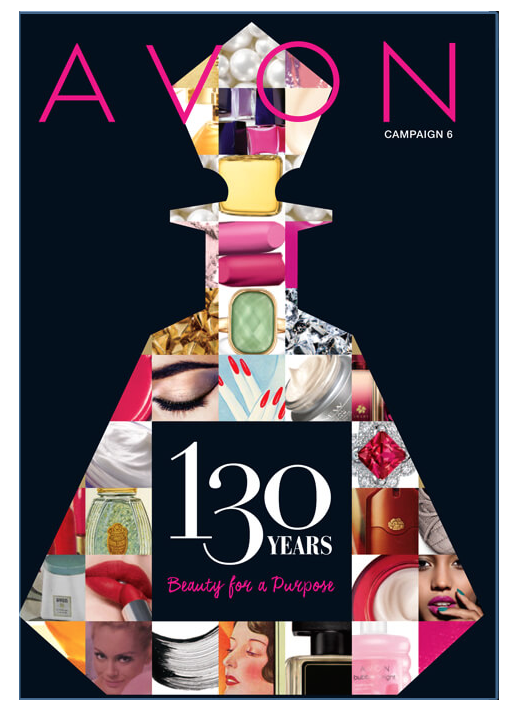 Eww. I certainly wasn’t about to choose the bread pudding option over the 15-layer chocolate ecstasy cake on any restaurant dessert menu! It wasn’t until I attended a Sunday brunch, at a restaurant which was local to me during my DC days, that I finally had the opportunity to try bread pudding. There, amongst the dessert table of fruity pastries, chocolate croissants, and elegant petit fours, was a large dish of warm bread pudding. This, my friends, is exactly why buffet-style dining delights my heart. I could take a risk-free scoop of that bread pudding without chancing disappointment and without the opportunity cost of my chocolate selection. Imagine my shock upon taking my first bite of that bread pudding! That bread pudding schooled me, for sure. It was not the soggy, unappealing concoction I’d imagined it would be, but rather a sweet, luscious treat for my palate. Think french toast, but sweeter and richer. I was reformed that day. I’d even consider passing up a heavenly slice of chocolate cake for a scoop of warm, homemade bread pudding. Now, that’s saying something! 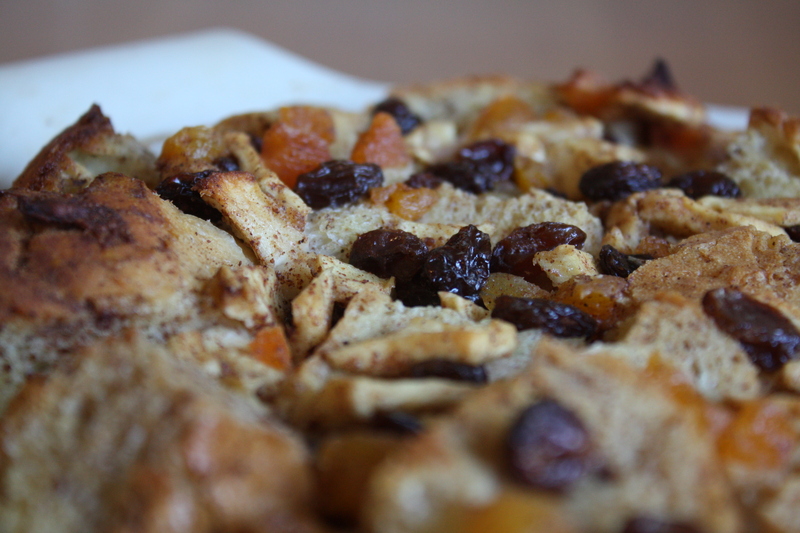 Here is my spicy, fruity take on a bread pudding; chunks of day-old French bread, topped with a spiced mixture of dried apples, apricots, and raisins, then baked to perfection in a sweet custard. Served warm, with a dollop of fresh whipped cream and sprinkle of cinnamon, this treat would make a fantastic dessert or decadent brunch treat for any occasion or no occasion at all! And if you’re ever in the DC/Silver Spring, MD area on a Sunday morning, check out the brunch at Mrs. K’s Toll House! Have a mimosa and a scoop of bread pudding for me while you’re there! Place chopped fruits in a bowl. Stir together the apple juice, cinnamon, nutmeg, and ginger. Pour the mixture over the fruits and allow to sit for about 30 minutes. Preheat oven to 350 degrees. Pour the melted butter into a large (about 2-quart) baking dish and swirl to coat the bottom and edges. Arrange the chunks of bread in an even layer in the baking dish. Scatter the soaked fruits in an even layer over the bread. Drizzle any remaining liquid over the bread. In a large bowl, whisk together the milk, eggs, sugar, vanilla, cinnamon and salt until well combined. Pour the mixture over the bread and fruit. Press down on the bread to ensure that all pieces have been moistened. Refrigerate for 15 minutes. Remove the baking dish from the fridge and press down on the top again. Bake for 45 minutes. Serve warm, topped with fresh whipped cream and a sprinkle of cinnamon. Posted in Baking, Desserts, Eggs, Food, Recipes and tagged baking, bread pudding, brunch, Cooking, dessert, food photography, md, mrs. k's toll house, Recipes, silver spring, treat, washington dc. Bookmark the permalink. A great way to freshen up left over bread:) Looks delicious and bet the smell is wonderful while this is baking in the oven! 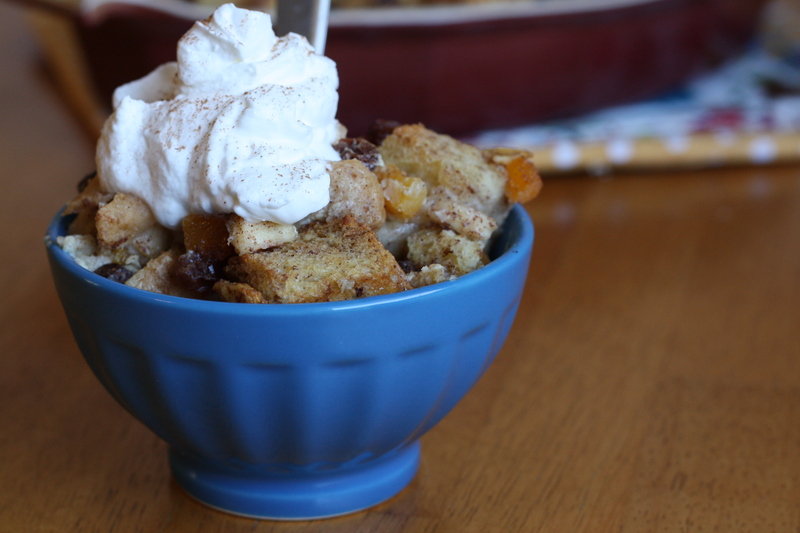 I absolutely love bread pudding – I remember my mom making it quite often when I was growing up. Your spiced version sounds superb. 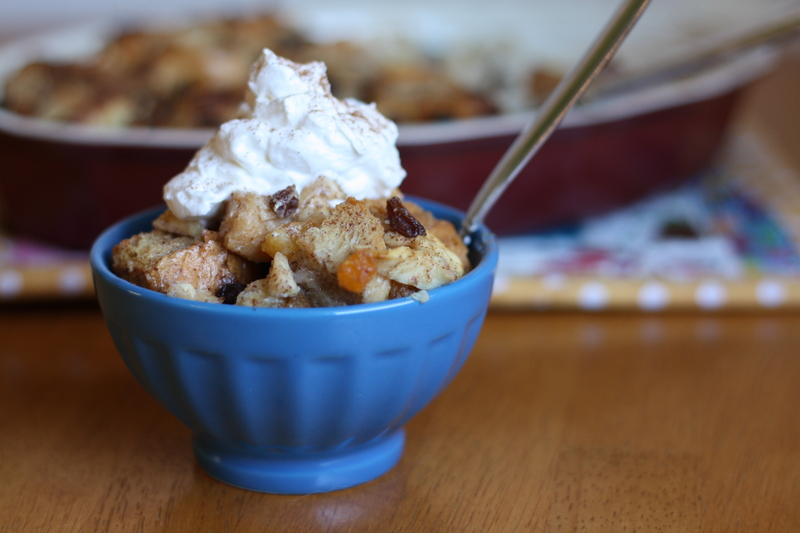 Bread pudding is one of my favorites. I’m so glad you were able to try it and experience its deliciousness! I love the idea of adding ginger to the bread pudding, it sounds amazing. 🙂 And it looks delicious too! I, like you didn’t taste bread pudding until I was an adult. I, like you was pleasantly surprised. Last fall I tried my hand at making it and used stale doughnuts instead of French Bread. Your use of ginger takes it up a notch. Great recipe! Love the idea of making this, but I fear I may be the only one in my house to eat it, as I have a bunch of chocoholics here. How is this as a “leftover”? BTW, LOVE Mrs. K’s Tollhouse! Works great as leftovers…just pop a scoop in the microwave for a few seconds to warm it! 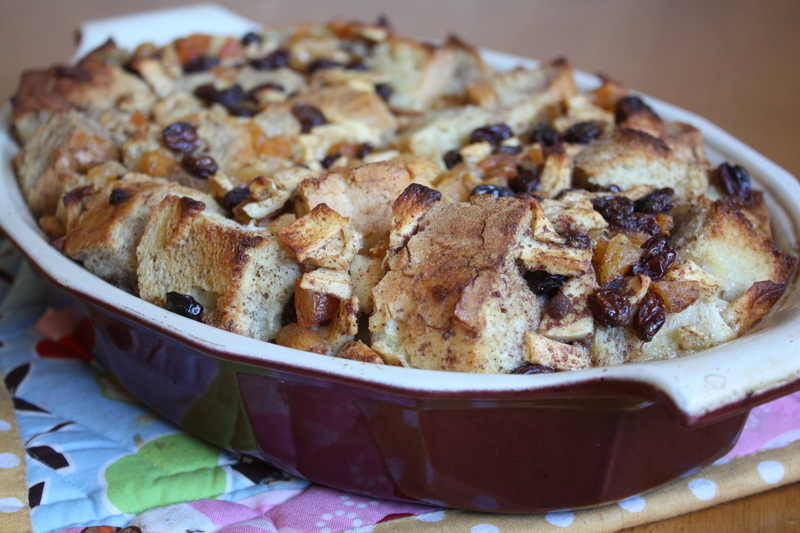 Maybe you can entice your family to eat it by reducing the spices and throwing some chocolate chips in there too…a Chocolate-Fruit Bread Pudding! !